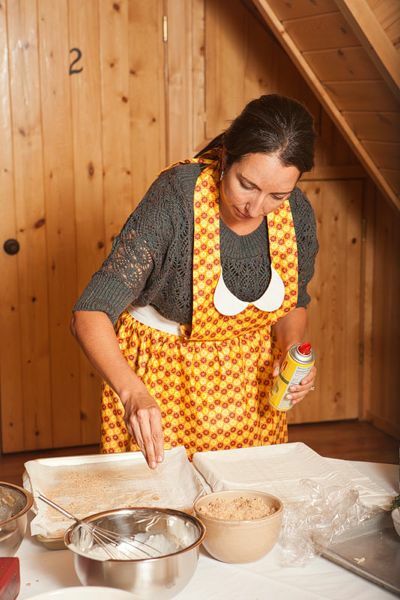 How do you feel about working with phyllo dough? It’s always pretty much scared me if I’m going to be completely honest. Up until recently I have had one experience with phyllo dough and it also included lots of melted butter, my oven and a smoke filled kitchen so I’ve pretty much steered clear of it ever since. 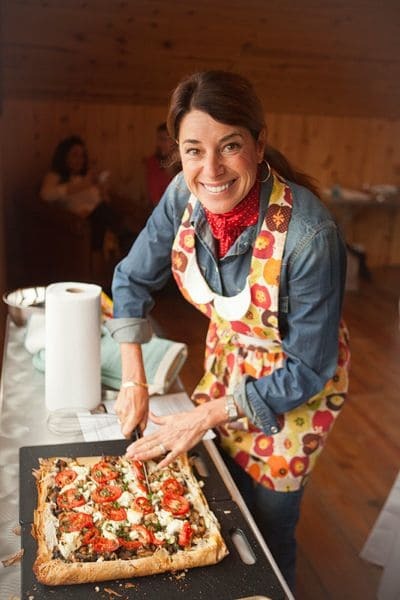 I cooked up this recipe with my Bush’s Beans friends (aka Team Bean) in Montana last month…it was one of about 6 recipes that we cooked up and shared with each other during that trip. It was also one of the recipes (in addition to this chicken one) that I made as soon as I got home. What’s so nice about cooking in a group, is what you learn from each other. This recipe was created by Connie Gutterson for Bush’s Beans and how lucky were we to actually have her available to walk us through making it step by step. I pretty much told her right away of my phyllo phobia so she really took the time to make sure I walked away feeling comfortable to make this again at home. Mission accomplished Connie! Take the time to defrost it the day before you are working with it. Unroll it, lay it out on a baking sheet, then keep it covered with a moist paper towel (or two) until you are ready to use it in the recipe. When layering your phyllo, spray each layer with nonstick spray (or olive oil spray) and sprinkle panko, breadcrumbs, or finely processed nuts between each layer to create small pockets of air that will help crisp it up and keep it light. Spray the edges of the tart with cooking or olive oil spray for a nice golden crust. This tart was SO good. I made it for my husband and I one night to munch on while watching a football game (not your typical football fare, I know, but when I’m the one cooking, I decide 😉 ). We both loved it and I enjoyed the leftovers for lunch the next day (it warmed up in the toaster oven very nicely). This would make such a nice dinner, paired with a green salad, or as an appetizer, cut into smaller pieces and nicely plated for guests during the holidays. Don’t forget to enter my Bush’s Beans giveaway…you have until Wednesday, November 9 at 12 noon (EST) to enter to win a grill pan, apron, spices as well as other goodies from Bush’s! 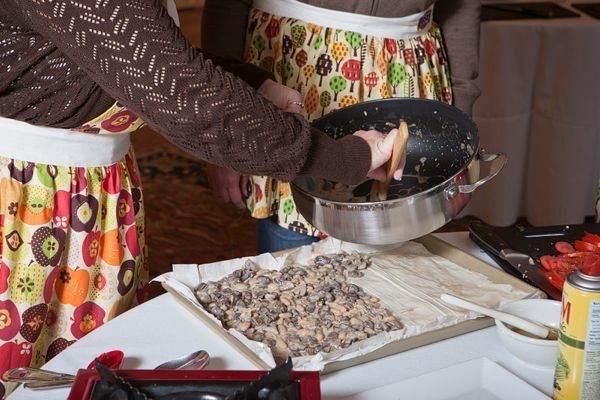 Thank you to Crackle Photography for all the amazing photos taken at our cooking event! Defrost phyllo dough (allow about 2 hours for defrosting). Heat a sauté pan over medium-high heat. Add oil and mushrooms. Sauté for 5-10 minutes or until mushrooms release their moisture and begin to shrink, cook mushrooms in batches if necessary. Continue cooking mushrooms until liquid has evaporated and mushrooms start to brown (if mushrooms are too wet, they will soak through the phyllo dough). 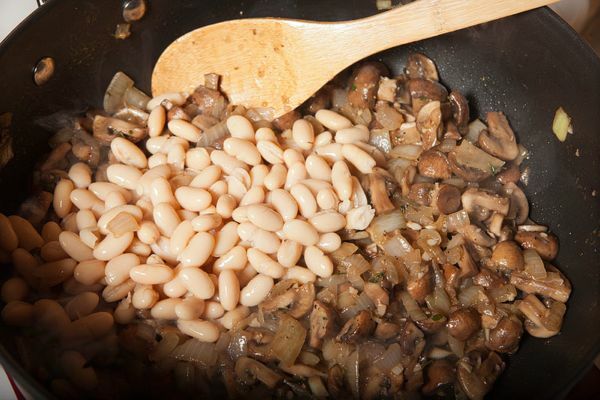 Add onions, garlic, cannellini beans and 1 tablespoon of herbs. Cook for 5 minutes or until onions are soft. Stir in zest. Season with salt and pepper. Let mushroom mixture thoroughly cool. Beat egg and sour cream. Add egg and sour cream to cooled mushroom mixture (egg will scramble if added to hot mixture). Salt and pepper to taste. Lay 1 large sheet of phyllo on a parchment paper-lined sheet pan, keep remaining phyllo sheets covered with plastic wrap. Spray phyllo with olive oil spray and lightly sprinkle with bread crumbs. Place another sheet of phyllo on top of bread crumbs, gently press down. Spray top sheet of phyllo with olive oil spray. Repeat the process with the remaining sheets of phyllo. Work quickly so the edges don’t dry out. Roll up 1-inch of each edge towards the center, forming a rim. The final tart shell should be 7”X10”. 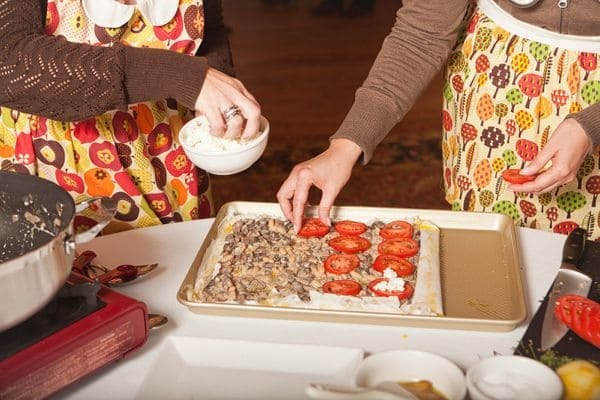 Spread mushroom mixture evenly over the phyllo. 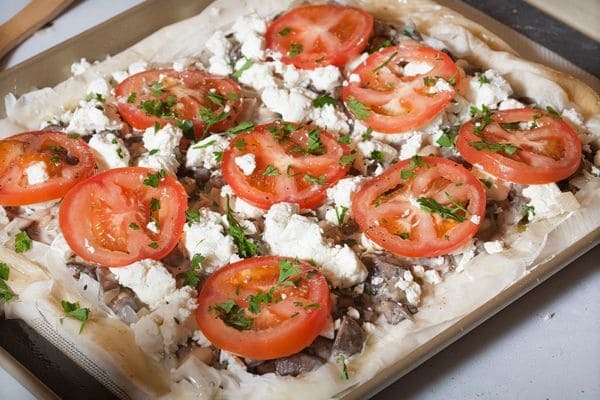 Top with tomatoes, sprinkle with salt and pepper, and evenly distribute goat cheese on top. Sprinkle with remaining 1 tablespoon of herbs. Bake in preheated oven for 25-30 minutes, or until the crust is brown and crispy. Cool on wire rack prior to serving. Recipe created for BUSH’S® Beans by Connie Guttersen, PhD, RD, nutrition instructor at the Culinary Institute of America and author of “The New Sonoma Diet” and “The Sonoma Cookbook” Sterling 2011. These pictures are so fun, looks like it was a great time. This recipes sounds delicious and so healthy! yum! Wow. This looks delicious! Yum! Looks so good, Aggie! Yes, I’m afraid of phyllo dough! You look so cute in your apron! This looks like a delicious meal. If you work quickly with filo it is so easy to accomplish an amazing dish. What a wonderful experience you had Aggie. Oh man I think I need to make this for my family when they are in town for Thanksgiving! Looks great!! This looks awesome. 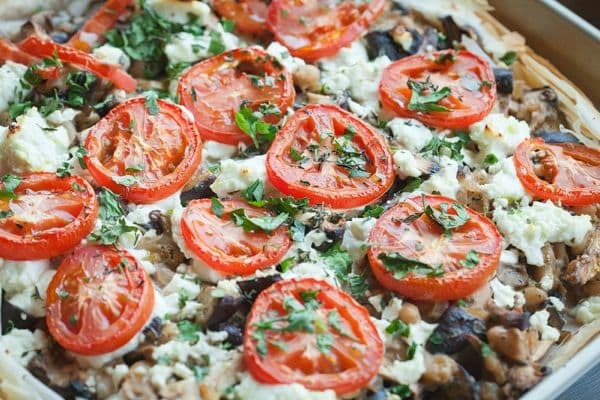 I love everything about it…beans…mushrooms…tomatoes. Yum! What a gorgeous tart. I love working with phyllo; it always makes such an elegant presentation in tart form. This looks great! I love white beans. I use them all the time…yum! Why do girls get the cutest aprons to wear?! You’ve got me wanting to try this now – I’ve never used phyllo dough before! Gasp. I know. Wow – that looks SO delicious! 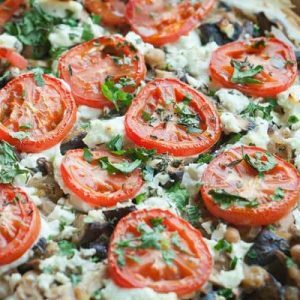 I love beans and this is such a creative recipe! Thank you for the terrific tips on using phyllo. I’ve worked with it before, but it was always a little nerve wracking! That tart is gorgeous. Loved all the helpful tips on working with phyllo. I have to say in my years of cooking I’ve steered clear. Looks beautiful! Cool weather screams for beans!